300 TC in twill provides durability and a luxuriously soft feel. Excellent moisture-wicking properties ensure you remain dry and comfortable. "I just wanted to say that sleeping on your bamboo sheets is like sleeping in the most luxurious resort 7 days a week." Joyanne L.
Feel instantly relaxed in our 100% organic bamboo bed sheets for the best nights sleep you will ever experience! 300 thread count in twill (equivalent to 1,000 cotton thread count) provides a luxuriously smooth and soft feel and durability. Generous sizing to accommodate beds of all sizes (even those with pillow-top mattress protectors). Allowance has been made during manufacturing for shrinkage. Set consists of one fitted sheet, one flat sheet and two pillowcases (for King, Queen and Double sizes) and one pillowcase (for King Single and Single). Anti-bacterial. Textiles are often in contact with microorganisms, such as bacteria or fungi, whether these microorganisms originate from the person wearing the fabric or from the external environment. These can cause such health concerns as infection, physical irritation and general fabric discomforts such as fabric rotting, or unpleasant odours. Bamboo does not need pesticides due to a natural antifungal and antibacterial agent, bamboo kun, that gives the plant resistance to pest and fungi infestation. There is evidence that antibacterial properties are present in the final product, and claims that 100% bamboo products remain odour-free after use. Hypo-allergenic. Great for sensitive skin and people who have allergic reactions to other chemically treated textiles. In a trial that Eastwind recently conducted of eczema sufferers significant improvement was seen when 100% bamboo sheets were used. Thermal regulating properties. This means that bed sheets are naturally warmer in winter and cooler in summer (by up to 2 degrees). Highly absorbent. Eastwind bed sheets wick moisture away from your body. Luxuriously soft. 100% bamboo textiles have a soft, silky texture, but without the slipperiness of silk. Durability. Long lasting, easy to wash and anti-static. Environmentally friendly. Bamboo is a fast-growing, sustainable and water efficient crop with average yields that are 3-6x greater than cotton. Most of the bamboo used to make bamboo fibre and fabric is grown in China by Jigao Chemical Fiber Company. They hold the patent on the process for turning bamboo into fibre. The bamboo is grown in accordance with the international organic standard of OCIA/IFOAM and the USDA National Organic Program to ensure each bamboo stalk is of 100% natural growth with no pesticides. All the fibre produced at the facility in China is Oeko-Tex Standard 100 certified which means that the use of chemicals in its production is below internationally accepted standards. Panda friendly. There are 42 species of bamboo which pandas eat but none of these species are used in the production of our bamboo textiles. Eastwind don't consider their 100% organic bamboo products to be "delicate". However, they do require some TLC to ensure that you get continued enjoyment from them. Please make sure that you follow the care instructions detailed below. 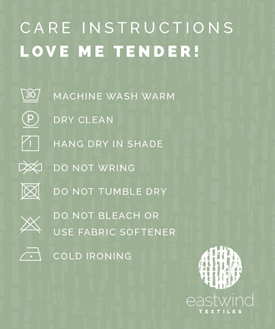 In addition Eastwind recommend that their blankets be gently machine washed and then line dried to ensure that they maintain their wonderful silky soft feel. What is the difference between twill and sateen sheets? The difference relates to the structure of the weave that is used. With twill sheets the weave is tight, short and fine. This makes them much stronger than sateen sheets. With sateen, the weave is longer which makes them softer to touch. These are hands down the best sheets ever!